So after 18 years of loyal service, that 30-foot oak tree finally met its match. A storm rolled in and sent your prized tree tumbling down on your yard—well, hopefully, it was the yard and not on top your house or car. You called your local tree removal service. They came, cut it up, removed the stump, and now you’re probably left wondering, what should I plant in its place? As Jackson, Mississippi’s Top Rated® Local Tree Service Provider, we have seen this scenario played out quite a few times. With over 12 years of experience in the tree service industry, we take great pride on our ability to expertly carry out a range of services, including tree pruning, general tree care, storm damage cleanup, and emergency tree removal services. In today’s blog, we would like to share with you some ideas for how to replace a fallen tree. Ideally, if you want to plant your new tree in the same place as the old one, you will want to have both the stump and big accompanying roots ground out. This will not only create a suitable environment for your new tree, but it will also remove the unsightly appearance of a stump. When doing this, it is best to remove as many of the roots as possible. 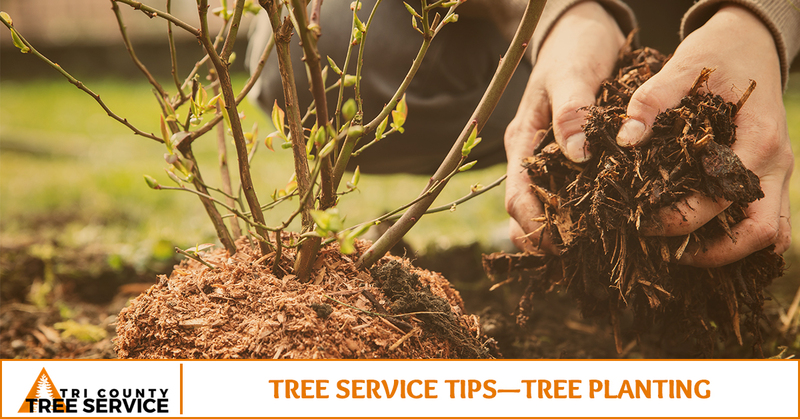 Aim to clear out an area that is three times the size of your new tree’s root ball. For example, if your new tree’s root ball is approximately 2-feet wide, you will want to aim to create a 6-foot root-free zone for your new tree. After stump grinding, it is only inevitable that a good amount of sawdust has collected in your replanting area. Do your best to remove as much of it as you can. Of course, you will not be able to remove all of it, but as long as you get the majority of it, your new tree will be fine. This is a decision that should be thoroughly considered. Remember trees are investments, and they will likely be on your property for decades to come. When choosing your tree, consider your personal preferences, as well as what works best with your landscaping and overall goals. Questions to consider include: Do you want an evergreen? A tree that will lose its leaves? A tree to provide shade? A tree to create privacy? Fruit tree? Or is now the time to add some hedges to your yard? Below are some possible replacement trees that are capable of thriving in Mississippi. After you have picked your tree, it’s time to move on to the fun part, the planting. For trees to grow up strong and healthy, it is essential that they are planted correctly. Though it varies somewhat depending on the tree, you will want to make sure your tree is planted at the appropriate depth, is given the right amount of water, and receives all the fertilization and mulching it needs.Though this is certainly something you can do on your own, to save yourself time and peace of mind, contact your professional tree service company to ensure that your replanting goes as smoothly as possible. From emergency tree removal to general tree services, we can handle all of your tree needs. Contact Tri County Tree Service today for professional and affordable tree services.